Micro Waterjet LLC (MWJ) is featured in the article titled “Fine Tuning Abrasive Waterjets for Micro Applications. Geologists say that the Colorado River once took a hard westward turn, then trickled its way across what is now northern Arizona to form the Grand Canyon. 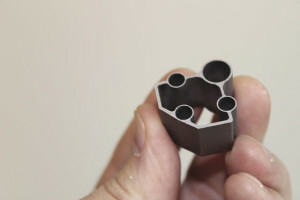 Abrasive waterjet pioneer Don Miller predicts there is another trickle coming, this one in the world of micromanufacturing. What Cutting Problems Are You Experiencing?